As lots of you already know, lately I’ve been all about two amazing DIY skincare items whipped up for my by my friend Chel at Holy Snails. Her Vita-Sea-Rum vitamin C serum and Shark Sauce sea kelp and niacinamide ampoule have been the superstars of my skincare routine ever since I got them, and using them has helped me clarify a lot of dissatisfaction I have with commercial cosmetics products. Vita-Sea-Rum is a pH 2.5, 15% L-ascorbic acid vitamin C serum with bonus vitamin E and ferulic acid. Sorry, C20 and C21.5, but our relationship is over. It was good while it lasted, but I’ve found my unicorn. Would you look at those ingredients. Why base it in water when sea kelp bioferment comes with extra moisturizing and antioxidant properties? Why do vitamin C without making it optimally stable and optimally effective through ferulic acid and vitamin E? Why not add licorice root extract for additional brightening and anti-inflammatory power? Why not? And every ingredient in it has a purpose, whether as an active, a humectant and thickener, a solvent, a pH adjuster, or a preservative. Skinceuticals has a patent on the C+E+ferulic combo at a pH of between 2.5 and 3, meaning that no other commercial cosmetics company can offer that specific trio of actives at that specific pH, but that doesn’t mean a motivated DIYer can’t make the same thing at home, and customize it to make it even better. My skin has taken some serious leaps and bounds forward since I introduced this serum into my routine. In conjunction with the Shark Sauce discussed below, the Vita-Sea-Rum is making quick work of the rest of my old sunspots, and my skin has been looking significantly firmer, especially in my problem spots around my mouth. This is ridiculously powerful stuff. And when all is said and done, apparently it costs pennies to make a bottle of it. And now for the coveted Shark Sauce! The idea for this ampoule sprang out of a late-night conversation with Chel. I lamented that all I want is something with lots of seaweed, and lots of niacinamide, and maybe some licorice root extract and sea buckthorn extract, and why is it so hard for cosmetics companies to just make crazy good products? Chel offered to whip me up something. This is what resulted. I would gladly give up every commercial product in this picture if that’s what it took to keep using my Shark Sauce. LOOK. JUST LOOK AT IT. Known, proven ingredients at known, proven percentages and in known, proven ratios where necessary (the ceramide complex, for example, includes ceramides and fatty acids at exactly the right proportions to repair the skin barrier). No filler. No unnecessary ingredients put in there for fragrance or fanciness or claims. You know that sea kelp bioferment? That’s the “secret ingredient” of Creme de la Mer, which is in many other respects no more special than blue tin Nivea from the drugstore. Again, Chel says making a bottle of this costs pennies. It’s an easy process (according to her) and it doesn’t take a fancy lab, manufacturing facilities, ultra-specialized equipment, or a degree in chemistry. Since I started using this, my skin has been INCREDIBLE. I wake up in the morning and it’s just luminous. My dark spots are bailing faster than rats off a sinking ship. My skin tone is more even. Even the persistent redness around my nose and mouth (which I blame on upper lip waxing) has subsided. This is all in less than two weeks! Bowing to popular demand, Chel’s posted tutorials for Shark Sauce. And the tutorial is here, with a giveaway so that some lucky reader can try the magic out! So here’s my challenge to cosmetics companies: Why can’t you produce something even remotely close to this? With the right percentages of ingredients like niacinamide and a base that’s not just water, but contributes even more skin benefits to the formulation as a whole? Why is it that 90% of products I look at are just globs of water, glycerin, mineral oil, and fragrance, with the really good stuff present in presumably miniscule amounts? If one all-too-modest DIYer can whip this up in an afternoon, why not a big cosmetics brand with all its resources and economies of scale? Shark Sauce is where skincare products should be. It can be argued, of course, that the vast majority of cosmetics consumers simply aren’t ingredient-savvy enough to care. It’s true that plenty of people are still getting bilked by all kinds of overpriced snake oil (AHEM CREME DE LA MER AHEM). But I think it’s clear that blogs are becoming a first-line resource for consumers making purchasing decisions, and blogs like mine, Skin and Tonics, Holy Snails, Snow White and the Asian Pear, Musical Houses, The Beauty Brains, and so many others are (I hope) making a difference in how people evaluate skincare products. You guys know I love my commercial skincare products. I continue discovering awesome things with every haul. Shout-out to Tosowoong, whose lines I’m slowly and happily working my way through. 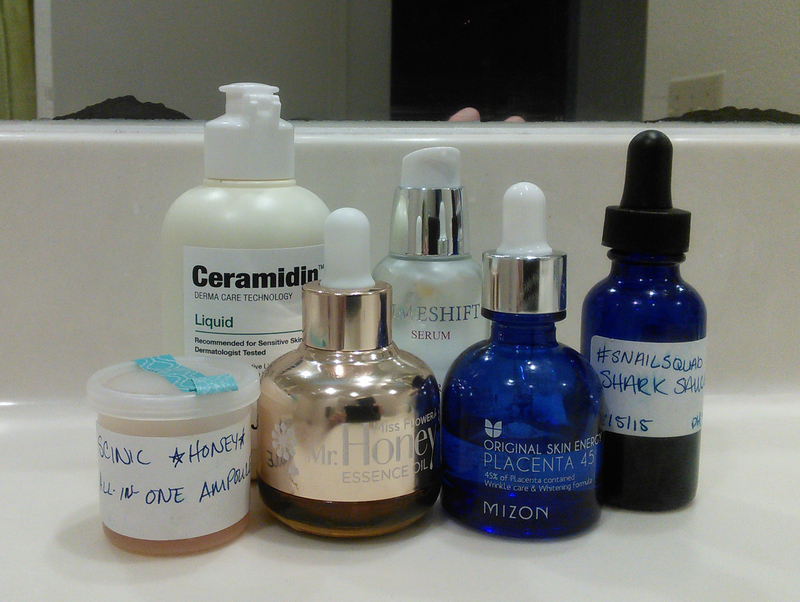 But I’ve yet to encounter a single commercial skincare product that can compare to Chel’s DIY potions. A lot of companies talk a big game about their products, but in the absence of published percentages, ingredients lists can be misleading. Results never lie, and I’ve been shocked at the rapid results I’m getting. Can you think of any commercial skincare products with ingredients and results comparable to Vita-Sea-Rum or Shark Sauce? Tell me all about them, because I’d love to know what I’ve missed! And be sure to enter Chel’s giveaway. That Shark Sauce is magic. Wow! I’m impressed, but I have to admit I still find the notion of DIY a bit daunting–I couldn’t even do the Lindsay modeling masks without screwing up, and I’d be afraid I would make a mistake that would leave a burn on my face. So, if HolySnails ever wanted to make some extra money (*cough*cough*), I bet I’m not the only person who’d be willing to pay for these products–I’d easily pay the price of the OST vitamin C serums + shipping. Otherwise, I think I’ll continue to observe for a bit, and maybe when I’ll feeling confident, try my hand at some of this DIY business one day. And I guess I should go enter her giveaway too! Will you post photos to show your awesome results? These are truly truly amazing! From now on when I haul, I’ll be constantly reminded of how I am simply paying the laziness tax on my serums/ampoules. Hmm, commercial products that have given me great results are the Pocketderm anti-aging to “reduce” pore size and the Drunk Elephant C-Firma Day Serum is a pretty ideal commercial vitamin C serum. 15% L-AA, Ferulic, Tocopherol, Marula Oil, HA, Algae, Camellia, Licorice, Fermented Pumpkin, Curcuminoids. & It’s at a nice and gentle pH of 3.2. It does rub me the wrong way that I don’t know the concentrations of the other bonus ingredients though. Can’t wait to see the before and after pics! I think your enthusiasm for this DIY stuff has rubbed off on me… I think I may give it a go in the fall/winter… next time I need a vit C serum. Finally decided on the PC C15 Super Booster yesterday. 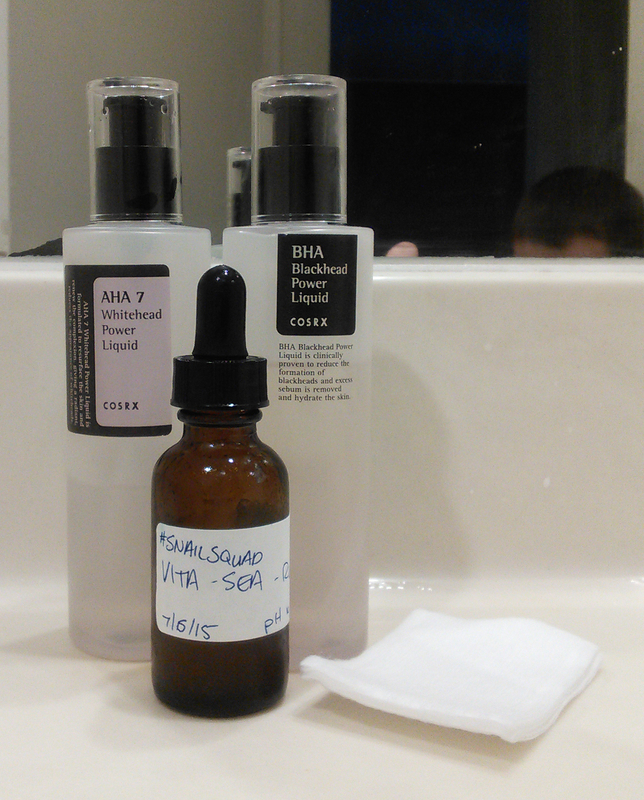 The vitamin C I do right after cleansing in the PM, and the Shark Sauce is the first serum step in AM and PM. Hmm, I can’t reply to the comment you just left but yeah I could imagine! You’re prob addicted to the stuff! Looking forward to see more concoctions you dream up besides Shark Sauce. I’ve been over at DIYbeauty for an hour now and just amazed by their community and resources! I’m thinking of doing a vit C serum, and maybe try to dupe that blue tansy oil retinol I think it’s by Sunday Riley? If it’s possible. OMG I want to dupe everything by Sunday Riley at some point. Apparently it would be pretty easy, since the majority of the work is just measuring and mixing oils. And YOU CAN GET RETINOL AS AN INGREDIENT. Can you imagine the possibilities?! Please PLEASE let me/us know if Holysnails would be willing to sell this magical unicorn in batches?! Pretty snail/shark please? Well the answer about the cosmetic companies is pretty obvious– if they sold products that so quickly gave results, then they’d run out of customers. You ladies have sold me on the DIY. After I use up my latest haul, I’m going to make some Shark Sauce. Anecdotally– my mom lives right by the ocean and will occasionally toss dried seaweed in the blender with some water and vitamin E –and use it as a face mask. She swears by it. But the thing is that with all cosmetic preparations, you have to keep using them or lose the effects, so I feel like what they’d do is make a loyal customer for life. I would absolutely pay for vita-sea and shark sauce! Darn US-only giveaways 😦 I’ll try to make my own but I’m not sure how easy it’ll be to find ingredients here in UK. It was hard enough finding rubbing alcohol to repair a broken eyeshadow last month! I’m glad the DIY is working for you! You’ve got to convince her to start a business! I really whished I had any knowledge about DIY cosmetics und could reproduce these serums, the recipes look great to me. Maybe I’ll find someone who could do it for me in Germany. I think one reason why cosmetic concerns don’t produce such powerfull conconctions is because they are not for everyone, not for people with really sensitive skin. And they want to sell to the mass market or a smaller group with really big money (to buy Creme de la Mer). Yes she should totally start selling! I love the idea of DIYing and all, but it’s actually trying to get all the ingredients I find daunting. Nothing ships here! (Or if it does its super expensive.) so generous of her to share the recipe though. YES. I was planning on doing a DIY vitamin C serum next because I’ve been so massively discontented with what’s available on the market, and I knew I wanted to do a waterless one with sea kelp bioferment as the base because why use less optimal ingredients when you’re making it yourself, but I was having problems figuring out how to modify the recipe. So this is very helpful! But yeah. I’m actually coming from the opposite direction – I’ve been DIYing for a while, and I’ve recently started dipping my toes in the AB sector for ideas and a new angle to approach things from. The whole fermented trend has been giving me a lot of ideas, given that I do a fair amount of lactic acid fermentation myself and I suspect I could do very interesting things by fermenting some skin-friendly items and using them as a base for a moisturizer. Or maybe just use the brine from my kimchi in skincare, but I’m not sure everything in that’s good for the skin. I don’t DIY everything – frankly, I’m lazy – but I do think DIYing skincare is really where you get the best bang for your buck. I read a lot about diy skincare before dipping my toes into asian skincare, but I’m still very hesitant to do it myself. As for your questions, the reason I believe company can’t be making these serums with these kind of ingredients are because cosmetic products have very high margin where advertisement take a big chunk. For really expensive products, they put in more $$ on packaging and that unique ingredient that looks good on the label. These ingredients are nothing special so it takes a lot of money in advertising for them to make people think their products are special. The majority of skincare consumers do not research ingredients in depth in spite of the available information on the net. Second, this DIY recipe have a lot of active ingredients, that can possible cause a reaction with more sensitive skin while cosmetic companies try to make products that work on the widest range of consumers as possible. The tutorial page is not exist?